Whether homemade or purchased, most groups today race on a 32 to 50 foot track, starting on a slope and transitioning to a long flat section. These tracks are made from aluminum or wood, and have from 3 to 6 lanes. Some variation exists, but other than length, ramp angle, transition radius, and composition, they are essentially of the same style. But there are some groups with unusual tracks. These can have curves, loops, an extreme length, or an unusual composition. In today’s article, I’ll share a few of these with you. In most cases, I include the source of the photo. However, in a few cases, I do not know the source. If the source is not listed, and you know the source, please let me know. If your group races on an unusual track, please send me some photos and I’ll include them in a future edition of the newsletter. 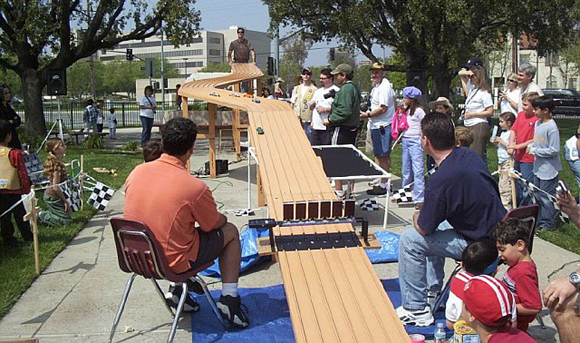 Generally, pinewood derby tracks do not have curves because the car’s rigid axles do not readily negotiate turns. But that doesn’t stop people from adding them to the track. The first track is unusual in that it not only has a big sweeping curve, but it also has a continuous gradual slope from start to finish (no rear- weighting on this track). The second track could be included in all of the categories in this article. 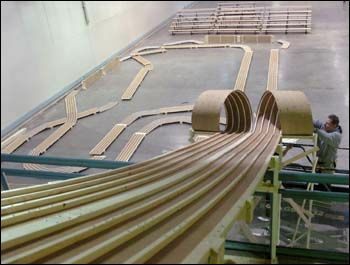 Named, “Goliath”, it is an attempt at the longest and tallest track. Unfortunately, there was no David around to defeat this giant, as no cars completed the track. 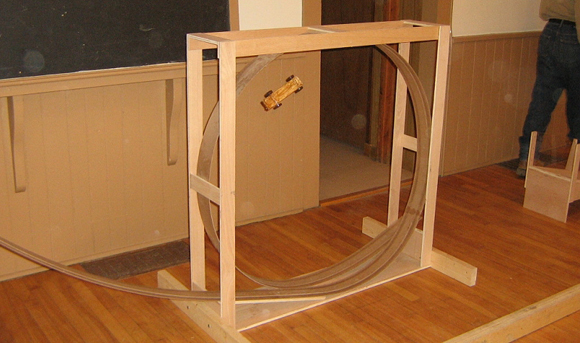 Sorry, but I couldn’t find a photo of the assembled track. Since BestTrack is now offering a loop, tracks with loops will likely become more common. Here is a track with not only a loop, but also a jump. The second photo shows the main problem with loops. 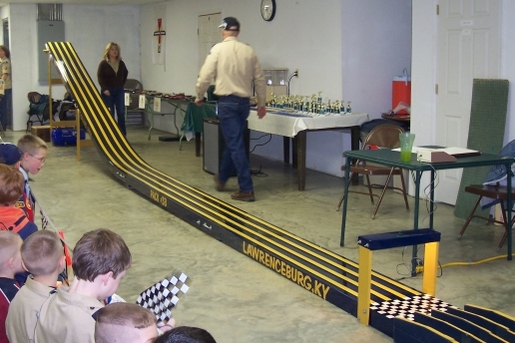 The first long track I ran across is used by an Awana group. 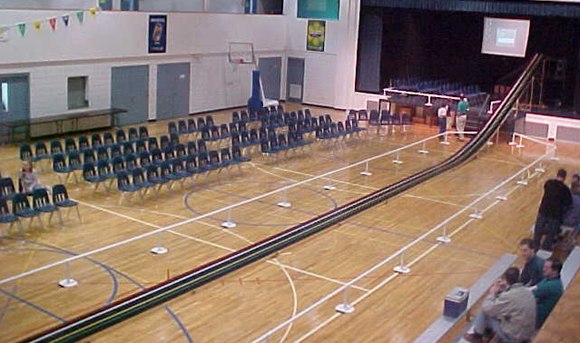 It starts on the stage of a gymnasium and runs almost the length of a basketball court. S-shaped tracks were at one time more common, but are now rare. 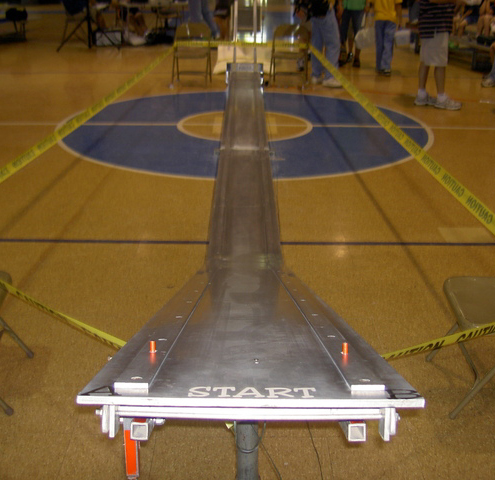 The unusual ramp and short run-out require a different weighting scheme. I have ran across many tracks of unusual composition including Plexiglass, Formica, etc. Unfortunately, I don’t have photos of these tracks, so I’ll share the following tracks with you. 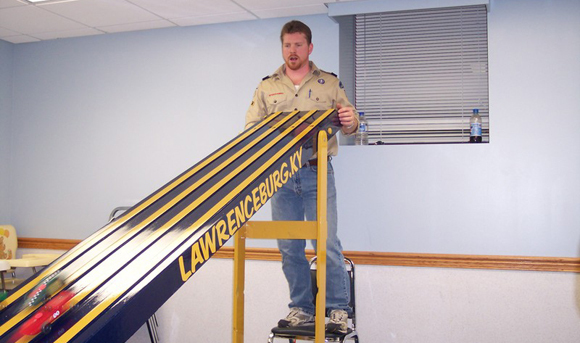 The first is from Pack 38 in Lawrenceburg, Kentucky. 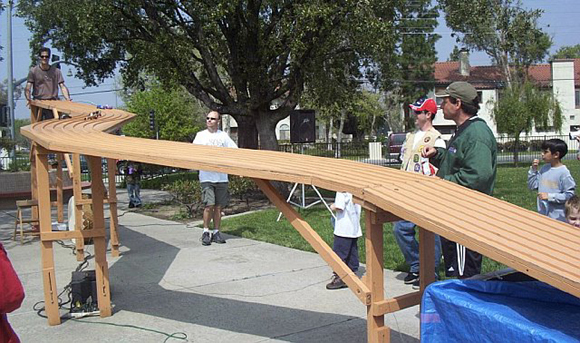 This track appears to be wood, but it really stands out for beautiful construction. The second track is apparently made from thick aluminum plates. It was used at a council race. I’m not sure why it only has two lanes when a third lane would clearly fit. If you look carefully, you will see two strips going up into the air at the end of the track. These are the braking lanes. Apparently, some cars fell off the strips. 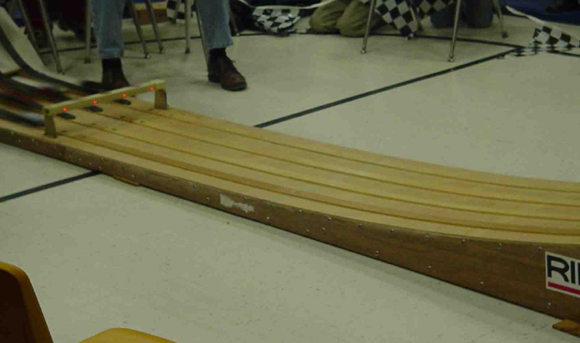 1The memory in this newsletter is from a family that participated in the Indiana State Museum pinewood derby event. Well, the boy thought about that for a moment, and decided to accept the offer. This is the car my daughter, Kaycie (age 10), and I built for her 2008 Powder Puff Derby. It is a basic wedge design with a few special add- ons. In front is what is left of a car after a large “boulder” had fallen on it. Behind are emergency vehicles coming “to the rescue”. The “Falling Rocks” sign was another creative touch. Although she did not win a ribbon for any of the “best of themes” (most colorful, favorite food, sporty, girl scout values, etc.) the car ran fast and we had a blast making it. After seeing my two-wheeled car, Bob dropped by Maximum Velocity to show me his version. 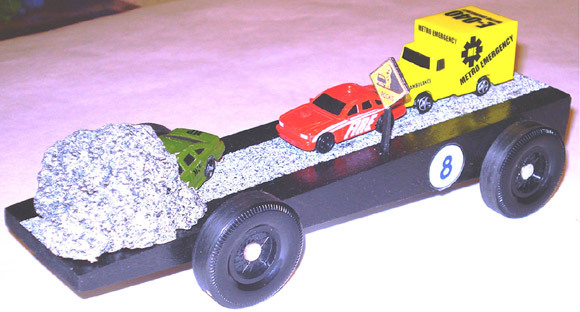 Modeled after a car that was entered at his pack’s race many years ago, it runs on the right-front, and left-rear wheels; the other wheels are off the ground. Unlike my car which is center-weighted, Bob’s car is rear weighted (balance point at 1-3/4 inch in front of the rear axle) by offsetting an underbody lead plate to the left. It is possible that this design could be made faster by using tungsten plates and shifting them further back. Nevertheless, the car is very fast; it has taken first in several races. 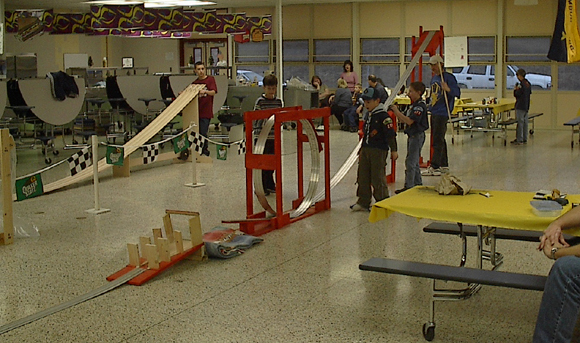 We had heard about the upcoming World’s highest and longest Pinewood Derby track event, so we decided to go. We picked out some cars from my son Patrick’s, collection, and I took him and his friend downtown to the museum. Patrick chose the car that he made as a Tiger Cub, an Indy-style racer. His friend, Bryce, picked out a car loosely based on the Dragonfire car plans that were part of a design booklet we had purchased. I got greedy and took two cars, a car based on a 60’s Indy Watson Roadster that I made for myself when Patrick was a Cub Scout (so I could keep my hands off of his car), and a vintage “skinny wheel” car made in the 1960’s. We had seen the track on TV, so we knew it was going to be high and long, but it was even more impressive in person. There were lots of friendly volunteers helping out with the racing. We quickly got our cars inspected, and were ready to roll. 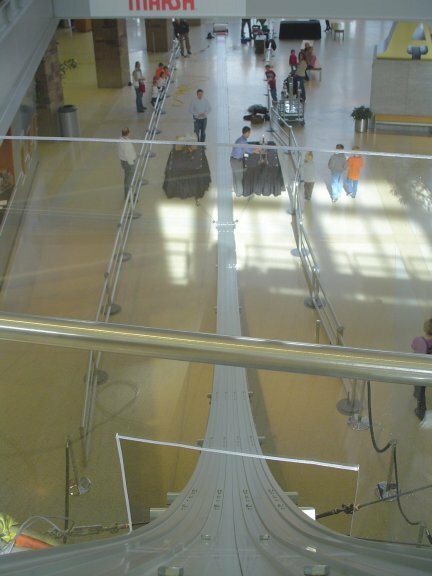 The aluminum track was four lanes suspended from the ceiling. The starting gate was perched over the second floor railing, and the track made a graceful arch down to the main floor and the finish line. The scoring results were recorded and displayed on a big screen TV near the finish line. Each car was allowed three timed runs. The fastest ten cars would be eligible to compete for one of the top five trophies that were being awarded for the event. All of our cars ran nicely, but not near the top ten times. The top times were in the 4.5 second range; the best any of ours did was 4.6 seconds. 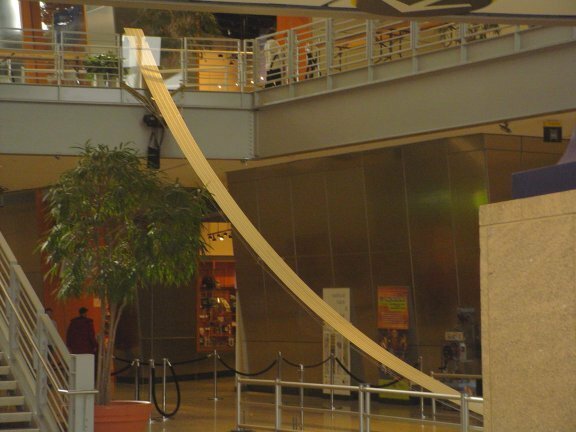 Still, it was awesome to see the cars from below, rocketing down two stories of Pinewood Derby Race track right down to the finish line. You don’t always have to win to have a good time. 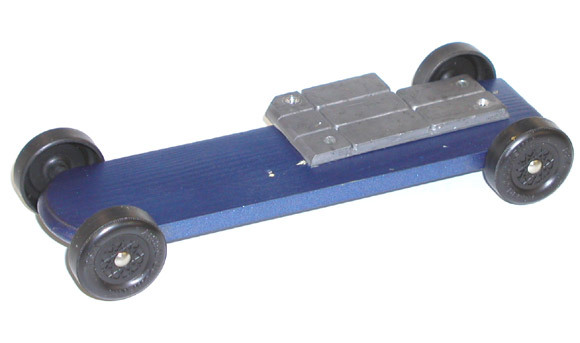 I was surprised to see the vintage Pinewood Derby car, made in the 1960’s, holding its own racing against the newer models. 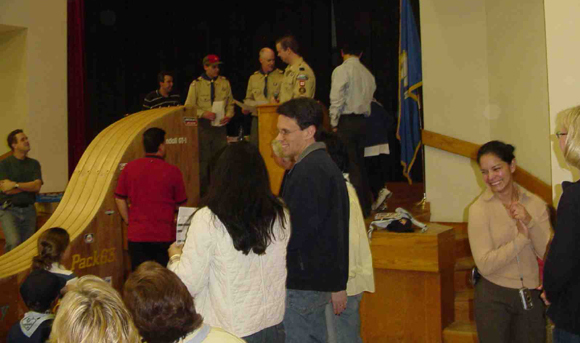 It brought back fond memories of my son’s Cub Scout enjoyment of the Pinewood Derby. I found this reflected in the faces of all the kids who were having the time of their life racing their cars on this day. In addition to the kids, there were several “Old Timers”, like me, who brought their boyhood creations down for one more taste of Pinewood glory. Two kids that we met that day stood out the most. One boy was there with his Mom. The boy’s dad was out of town, so Mom got Dad’s old Pinewood car for the young man to run. It was probably a seventies car. The builder used the wider 70’s tires for the back and a couple of older skinny wheels in the front. It gave the car a very distinctive look. The son was having the time of his life “driving” daddy’s car. The other youngster who caught my attention was probably 6 or 7 years old. His car was one that he had made “All by himself”… with a little help from Mom. The car, was nicely painted silver, and had a Lego driver in the cockpit, with horns on it’s helmet, and he had found a matching sticker to decorate the back. It was really neat to see the joy and pride on the face of that little boy — it brought back lots of fond memories of Pinewood Derbies past. All in all, we had a really great day taking part in a bit of Pinewood Derby History. I heard from one of the volunteers that they may make this into a yearly event. I sure hope so. I always look forward to the mold characteristics table and I always get a bunch of wheel/axle kits to do some of my own testing. My question is, why are molds 17 and 18 not included in your tests? Were they any good this year? Molds 17 and 18 disappeared – we haven’t seen any wheels with that marking in quite a while. They may have been removed for retooling, and will show up again. 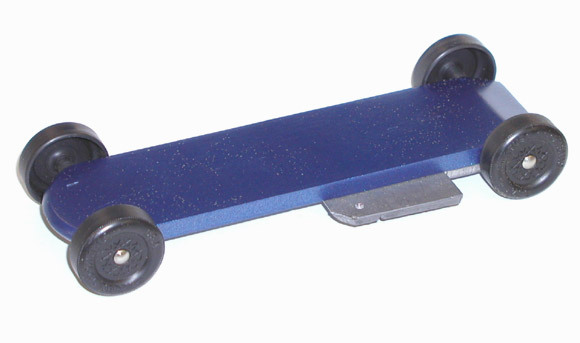 Should I paint the wood where the wheels contact the wood, or is the bare wood a better surface for lube? I like to paint the area, as long as the paint has time to completely dry. A clear coat helps as well. The paint will usually provide a slicker, harder surface than bare wood. But don’t use enamel paint. Enamel takes a long time to cure, and then seems to soften if the wheel hub rubs against it enough.